Now that we're back from our mini Salzburg vacation, here's a little travel report. From our hotel, we walked to the Mirabelle gardens, where my son sang Do-Re-Mi on the same steps where Maria taught the children to sing. We took the funicular up to Salzburg's fortress, where I had a few hopeless moments as we toured the war and weapons displays. While my son thrilled at the swords and guns, all I could think of was that for thousands of years, mankind has been coming up with more efficient ways to kill each other. And we're still working on it. 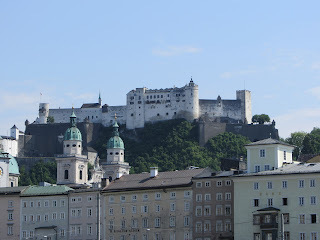 Lighter thoughts came from the fortress' beautiful views of Salzburg and the Salzach river, plus a room the kids liked even more with marionettes and cutouts where you could get your picture taken. The next day, we were squirted by the 400 year old trick fountains embedded in the walkways and even chairs (!) at Castle Hellbrunn. Drying off, we romped with the kids at a playground sporting a majestic view of the Untersberg mountain. We even got caught in a rainstorm standing right in front of the Sound of Music gazebo! 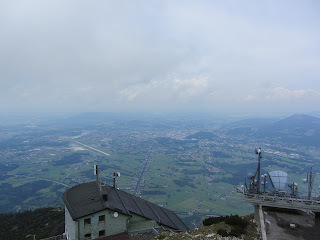 The sky miraculously cleared and we took a cable car up 5900 feet. Me: mouth dry, knees locked, keeping up a brave front for my nervous seven-year-old - who then proceeded to lean against the flimsy looking door. I'm not usually scared of heights, but the thought crossed my mind that all God had to do was purse his lips and exhale, and I would be tossed right off the mountain. Our last day in Salzburg was rainy, but one of my favorite memories. We went to a Sound of Music exhibit. Besides all sorts of pictures and information, there was a set of headphones playing My Favorite Things in about ten languages. We had to drag my five year old son away after he spent twenty minutes intently singing loud and off key to music only he could hear. Our three days were over, but the kids didn't want to go back home. I don't think my husband and I were so eager to get back to work either. At home, we tend to get caught up in all the things that need to be done, but with sights so close to each other in Europe, we should try to do this more often.